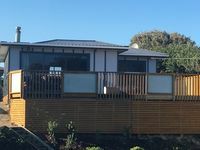 Property 53: Himatangi Hideaway, a place to relax. Hydrabad Hideaway... The ideal place to relax. Property 65: Hydrabad Hideaway... The ideal place to relax. Booked this house for the weekend with group of ladies doing the Waiterere Great Forest Run walk. House was very clean and tidy with a lovely warm fire. Jodie was great to deal with. Would stay again!